The much-awaited Boston Magazine’s 2019 Top Doctors list reveals that nearly a quarter of the best dermatologists around Boston are right here at SkinCare Physicians! As in many years past, the vast majority of our physicians are recognized as being “Top Doctors” in their field: Nine of our physicians are listed among the 40 best dermatologists in the Boston area, and our oculoplastic surgeon is acknowledged as a top ophthalmologist. It is gratifying to see so many of our physicians recognized and appreciated for the expertise and skilled dermatology care with which they treat every patient. 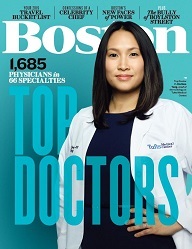 Our doctors are recognized by Boston Magazine year after year, and this would not be possible without the exceptional work of our nurses, clinical staff, and administrative staff who assist our doctors and patients each and every day. Congratulations to all the physicians who were selected! View the list of Boston Top Dermatologists. "The staff at SkinCare Physicians is highly professional and informative. I like to think of them as my SkinCare consultants." "Excellent Greetings – Personal phone calls for reminders and listening professionals plus my medical problem is resolved after 40 years." "I really enjoy and appreciate the doctors and Dr. Kim’s kindness. She has helped me out so much. I would recommend this office any day." "Dr. Phillips is a SUPERB physician! She kept us informed in a timely manner and follow-up was excellent." "The staff is always pleasant and takes good care of the clients. Dr. Sobell is always upbeat and encouraging." "Dr. Kaminer is a genius. My ears are perfect like brand new. Thanks so much." Our team of renowned physicians and experienced support staff is committed to excellence in medical skin care and cosmetic procedures with a patient-centered focus for women and men in the greater Boston area and beyond. Say goodbye to underarm sweat and odor. miraDry® is a quick, non-surgical treatment providing immediate, long-lasting results with minimal downtime. The form below should not be used by patients to communicate clinical questions to SkinCare Physicians. It is not a patient portal. If your message is of an urgent, clinical or confidential nature, please call us instead at 1-617-383-8201. Copyright © 2019 SkinCare Physicians®. All Rights Reserved. The dermatologists and other medical professionals at SkinCare Physicians specialize in a wide range of dermatology treatments and services, including laser hair removal, laser skin treatment, hair transplant, eyelid surgery, body contouring, psoriasis, skin cancer, BOTOX® Cosmetic, fillers, and Thermage®. From their offices in Chestnut Hill, they serve Boston, Brookline, Cambridge, Newton and Wellesley.